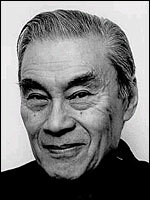 Best known for his regular role in the Pink Panther films, Burt Kwouk has long been one of the most familiar Chinese faces in British films and television. Although he was born in Manchester on 18 July 1930, his parents were returning to their native Shanghai at the time. At seventeen he moved to the United States to read politics and economics, and the Chinese revolution of 1949 wiped out his family's wealth. He returned to Britain in 1954, where he did various menial jobs before his girlfriend, as he put it, "nagged me into acting". His onscreen debut was as a Malaysian in Windom's Way (d. Ronald Neame, 1957), and his big break came with a small but credited role in Inn of the Sixth Happiness (UK/US, d. Mark Robson). This led to a low-profile but regular career in such films as the Hammer -produced Visa to Canton (d. Michael Carreras, 1960) and The Terror of the Tongs (d. Anthony Bushell, 1960), James Bond films Goldfinger (d. Guy Hamilton, 1964) and You Only Live Twice (d. Lewis Gilbert, 1967) and popular TV series like Danger Man (ITV tx 1960-61) and The Avengers (ITV, 1961-69). His biggest break came in 1964, when director Blake Edwards offered him the role of Inspector Clouseau's manservant Kato in A Shot in the Dark (US/UK, 1964), a role that he would reprise (with the alternative spelling Cato) in Return of the Pink Panther (1974), The Pink Panther Strikes Again (1976) and Revenge of the Pink Panther (1978, all films d. Edwards). The running gag was that Cato would keep Peter Sellers ' bumbling Clouseau constantly on guard by attacking him at random, usually inconvenient moments. The role outlived Sellers' death, as Kwouk also appeared in the three posthumous Pink Panther sequels. Aside from Cato, Kwouk's most memorable big-screen appearances were for directors Jerzy Skolimowski ( Deep End , US/West Germany, 1970), Norman Jewison ( Rollerball , US, 1975) and Steven Spielberg ( Empire of the Sun , US, 1987), though his television roles tended to be more substantial. Chief among them was Captain Yamauchi in Tenko (BBC, 1981-84) and Peter Lo Ching in The House of Eliott (BBC, 1991), though he also augmented his cult following by narrating the English version of Japanese series The Water Margin (BBC, 1976-8), hosting BBC2's Kung Fu Night (tx. 24/5/1997), co-starring in comedian Harry Hill's eponymous series (Channel 4, 1997-1998) and presenting Channel 4's bizarre interactive gambling show Banzai! (2001-04). In January 2003 he made his debut in the BBC's Last of the Summer Wine as Chinese electrician Entwistle, a part that was written with him in mind. His instantly recognisable voice has also narrated countless TV commercials. In a 1981 interview, Kwouk conceded that many of the parts he played were little more than racist caricatures. But he defended this, saying "I look at it this way: if I don't do it, someone else will. So why don't I go in, get some money, and try to elevate it a bit, if I can?"